USUALLY I remember to tidy up my list before the kids’ birthdays…but this year, um, no. Because I am a moron. So well-meaning people bought my kids a half-dozen books I’d never have spent actual cash money on. Oops. 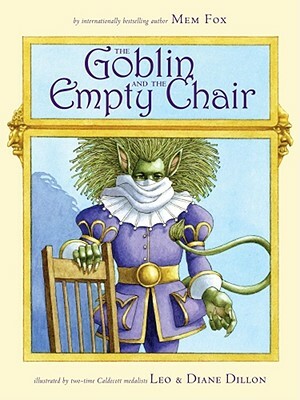 The Goblin and the Empty Chair is everything I think I hate in one book: lame fantasy creatures like goblins, check. Ren-Faire-looking illustrations, check. Somber portentious tone, check. I felt sorry for Maxine when she opened it. Maybe I could tolerate one reading of it as a library book, but MAN I wanted to own it only slightly less than I want to own Sarah Palin’s autobiography. But guess what? I loved it. And Maxine (age 5) loved it. So I am a double-plus moron and a crappy predictor of what I and my kids will like and you should whack me upside the head when you see me and then you should buy this book. As other reviewers have said, it’s a little fable about a goblin who sees his reflection and thinks he’s hideous and hides from the world, but secretly does little kindnesses for a grieving family. The text isn’t explicit about why they are sad, but there are subtle clues in the illustrations. Four family members in a painting on their wall, but only three in the house; the little boy in the painting appears in another painting, solo, in his sister’s room. And then you see the empty chair. The story has such a moving message about grieving and healing and helping. It shows kids, in a non-ham-fisted way, that when you help others, you also help yourself. It’s lovely. The art is still not my thing, but it totally works for this story. Yay for serendipitous non-list-maintaining boneheadedness. Thanks for checking out the link. By the way, I use my amazon wish list the same way – as a library reminder list! But I don’t send the list to anyone so I never have to clean it up, thank goodness.